Over the last month, we saw the beginning of a passionate love that has the potential to last for many years. Budster has fallen in love with Lego. Up until now, Budster’s favourite toys have been hammers, brooms, even lemon squeezers, and of course, books and paints. 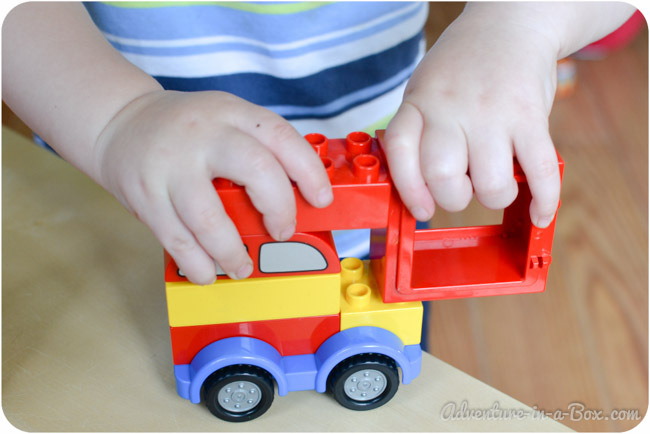 He has liked to play in dirt and splash in water, but one night, his Daddy, a person with a long history of Lego building, found a block with wheels and made a car for Budster. 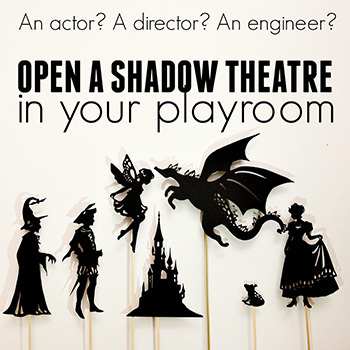 It changed everything, and Budster spends hours every day, creating whimsical constructions. As a result, a lot of our games have taken a Lego spin. We are fond of playing our favourite books out. 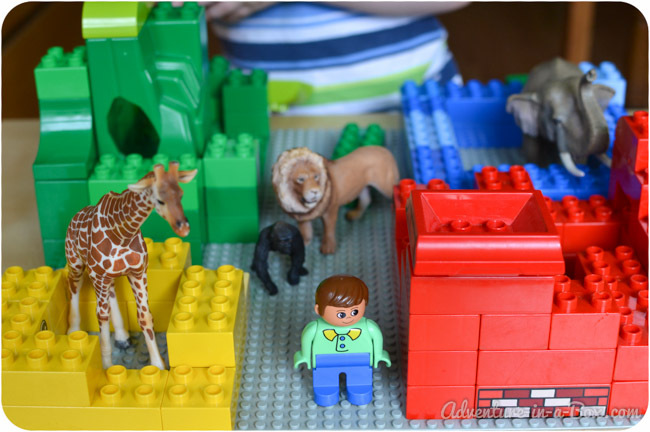 Good Night, Gorilla (review) is still high on the list of our favourites, and colourful blocks of Lego seemed perfect for creating a zoo scene. 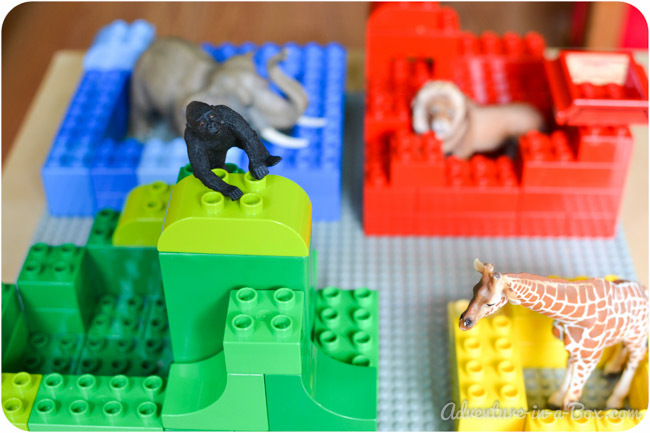 Every animal’s cage is painted differently, so we collected four different colours of blocks and built cages. Afterwards, Budster worked on making a car for the zookeeper. In Budster’s world everything is better if you add a car. And why not? The zoo is big, and the zookeeper needs to hurry home to his missus. 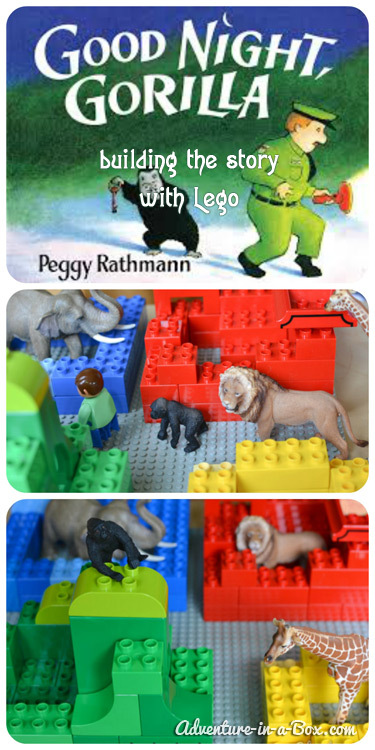 We had two Lego guys, and we used Schleich figurines for animals. We picked a gorilla , a lion , an elephant and a giraffe . We do not have a hyena or an armadillo, but we once invited a moose into the game. 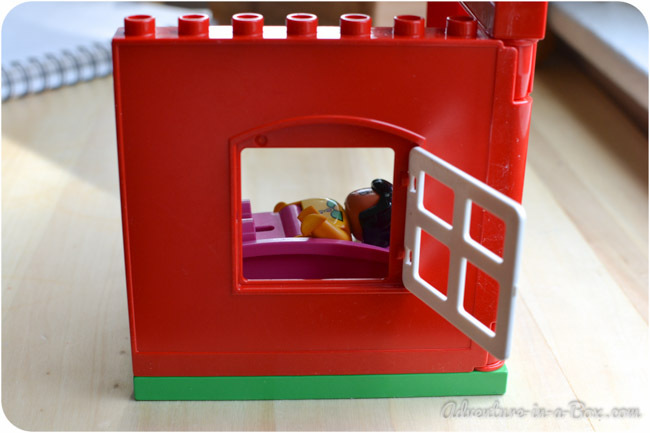 Everyone wants a chance to sleep in the zookeeper’s house. All the characters took their places, and the story began. Budster listened and helped me move everyone around. One night, the zookeeper was taking a stroll… pardon, a ride around the zoo. He wanted to check on all the animals and wish them a goodnight before heading home. But when he stopped next to the gorilla’s cage, the little rascal stole his keys and got out. Not only did the gorilla break free, he also decided to help his buddies. First, the gorilla opened a lion’s cage… and then it was giraffe’s turn! 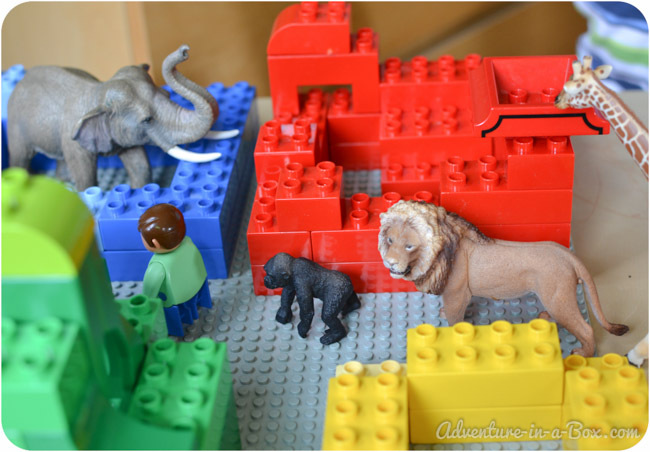 They all followed the zookeeper, as he stopped next to the elephant’s cage. And guess what happened after that? They let the elephant out too! In the house, Mrs. Zookeper was dozing off in bed, waiting for her husband to come home. Little did she know how many guests she would have tonight! If you are familiar with the story, you know what happens next. 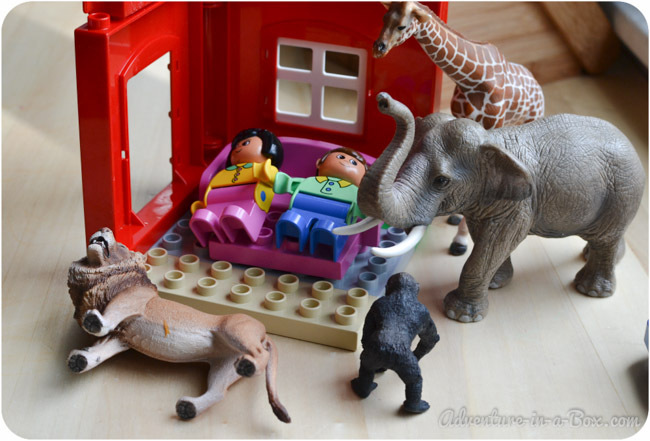 When Mrs. Zookeeper woke up in her Lego bed and saw the gorilla next to her, Budster giggled just the way he does when he sees that page in the book. 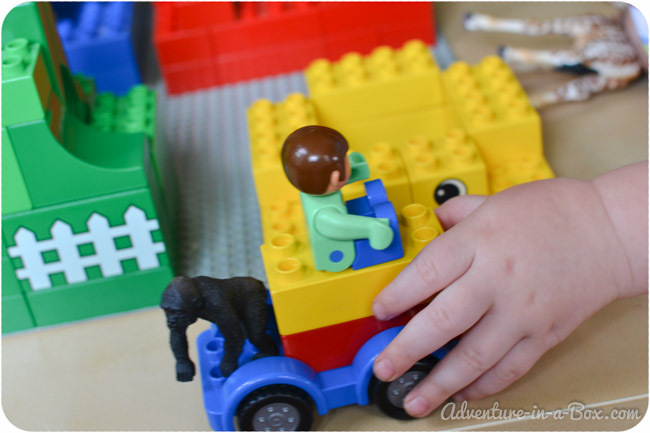 We enjoy building a Lego zoo, and played this game many times, making more elaborate cages and, of course, modernizing the zookeeper’s car! Or “cah-ee”, in Budster’s language. A funny fact: he is capable of saying this word right and does it most of the time, but when he feels particularly affectionate to his vehicles, he tenderly calls them “cah-ee”. 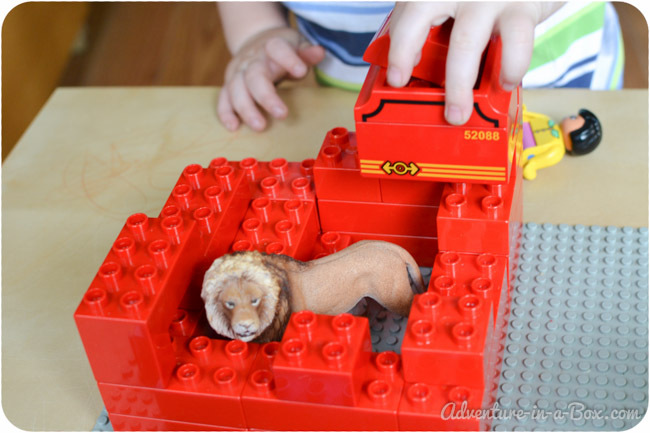 What have your children built of Lego recently? 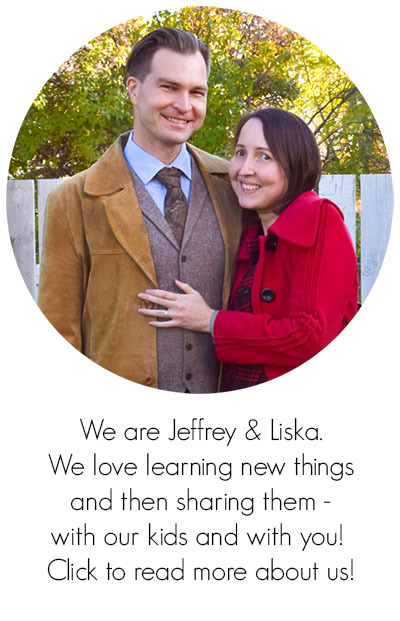 We would be happy to see pictures of their creations on our Facebook page. 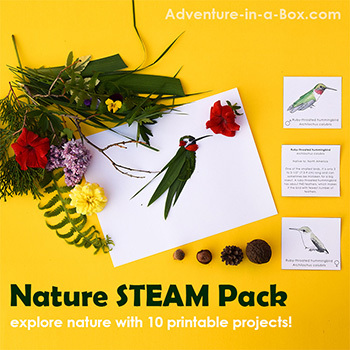 If you want to stay updated on other stories from Adventure in a Box, consider subscribing to our Pinterest or Instagram pages. Thank you for reading! I love this!!!!! I just read this book to the kids at the daycare, can’t wait to do this with my nephew! 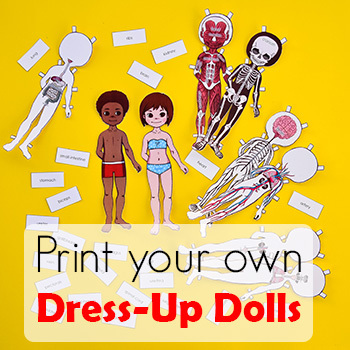 What a fun way to retell and expand the story!